Ahmed Hassan al-Bakr was de jure leader of Iraq from 1968 to 1979. By the mid-to-late 1970s, Saddam's power within the Ba'ath Party and the government grew; he became de facto leader of the country, although al-Bakr remained as president, Ba'ath Party leader and Revolutionary Command Council chairman. In 1977, following a wave of protests by Shias against the government, al-Bakr relinquished his control over the Ministry of Defence; Adnan Khairallah Tulfah, Saddam's brother-in-law, was appointed defence minister. This appointment underscored the clannish character of the Ba'ath Party and the government. In contrast to Saddam's fortunes, those of al-Bakr's were on the wane. Rumours of al-Bakr's bad health began to circulate in the country. By the end of 1977, al-Bakr had little control over the country through his office as president. The reason Saddam did not become president until 1979 may be explained by Saddam's own insecurity. Before making himself de jure head of state, Saddam initiated an anti-communist campaign; the ICP had no real power, and most of its leading officials had left the country or been imprisoned or executed by the Ba'ath government. The campaign was not centered on the ICP, but also Ba'athists who did not support Saddam. Saddam had initiated a similar campaign in 1978, that time to check where the loyalties of certain left-wingers were: Ba'athism or socialism. Following the campaign, Saddam entered the Arab-world stage for the first time under the banner of Nasserism and Gamal Abdel Nasser by criticising the Camp David Accords between Anwar Sadat of Egypt and the state of Israel. In response to the Iranian Revolution, several Iraqi Shias revolted against what they saw as a Sunni-led government, which led to the collapse of the Ba'ath Party in certain areas of the country. It was in this situation that Saddam took over the offices of president, Ba'ath Party leader and Revolutionary Command Council chairman. Izzat Ibrahim al-Duri was promoted to the office of vice-chairman (equivalent to the post of vice-president in the West). There were also rumours within the top echelons of power that al-Bakr (with the assistance of Iraqi Ba'athists who opposed Saddam) was planning to designate Hafez al-Assad as his successor. Immediately after Saddam seized power, over 60 members of the Ba'ath Party and the government leadership were charged with fomenting an anti-Iraqi Ba'athist plot in collaboration with al-Assad and the Damascus-based Ba'ath Party. Demoralized Iraqi POWs at Khorramshahr. Once he assumed the presidency, a cult of personality was created around Saddam. He was represented as the father of the nation and, by extension, of the Iraqi people. National institutions (such as the National Assembly) were established to strengthen the image of him fostered by the Iraqi propaganda machine. The Ba'ath Party also contributed to the cult of personality; by 1979 it was a nationwide organisation, and became a propaganda center for pro-Saddam literature. The propaganda campaign (at least in the beginning) created a common sense of nationhood for many Iraqis. The Shia protests were not quelled by these propaganda campaigns, and the establishment of an Islamic Republic in Iran influenced many Shias to stand up against the Sunni-dominated government. At first relations between Iran and Iraq were fairly good, but ideological differences could not remain concealed forever. The new Iranian leadership was composed of Shia Islamists, while the Iraqi Ba'athists were secular. Iran has become concerned about the Iraqi government's continued repression against the Iraqi Islamist Shias. At the beginning of 1980, several border clashes took place between the two countries. Iraq considered the newly established Iran to be "weak"; the country was in a state of continued civil unrest, and the Iranian leaders had purged thousands of officers and soldiers because of their political views. Donald Rumsfeld, as US special envoy to the Middle East, meets Saddam Hussein in December 1983 (video). Retreating Iraqi forces sabotaged Kuwaiti oil wells, causing massive fires across Kuwait's oil fields. Ahmed Hassan al-Bakr (left), the Regional Secretary of the Iraqi Ba'ath, shaking hands with Michel Aflaq, principal founder of Ba'athist thought, in 1968. Saddam Hussein (right) talking with founder of Ba'athism and Ba'ath Party leader Michel Aflaq in 1988. Kurdish peshmerga (opposition forces) in northern Iraq during the Iran–Iraq War. Saddam Hussein (left) talking with Michel Aflaq in 1979. This new influx of religious involvement into the government had sectarian undertones. The government's attempt to cloak itself in Islamic conservatism saw it launch verbal attacks on Iran, which were perceived by Shia Iraqis as being veiled attacks on their community, due to the shared faith between them and Iran. Sunni rhetoric emitting from the Iraqi government sought to discredit Iran, with scathing criticism stating that they were subscribing to a " foreign and heretical form of religion". While daily newspaper Babil, owned by Saddam's eldest son Uday Hussein, once was considered a staunch opponent of the campaign, arguing that it would undermine Iraq's religiously pluralistic society and encourage sectarian division, at another point it railed against Shias, referring to them as rafidah, a hateful epithet normally used by ultraconservative Salafis only. Alexei Kosygin (left) and Ahmed Hassan al-Bakr signing the Iraqi–Soviet Treaty of Friendship and Co-operation in 1972. According to historian Charles R. H. Tripp, the Iraqi–Soviet Treaty of Friendship and Co-operation upset "the U.S.-sponsored security system established as part of the Cold War in the Middle East. It appeared that any enemy of the Baghdad regime was a potential ally of the United States." In response, the U.S. covertly financed Kurdish rebels led by Mustafa Barzani during the Second Iraqi–Kurdish War. The U.S. disliked Iraqi support for many Arab and Palestinian militant groups such as Abu Nidal, which led to Iraq's inclusion on the developing U.S. list of State Sponsors of Terrorism on 29 December 1979. The U.S. remained officially neutral after Iraq's invasion of Iran in 1980. In March 1982, however, Iran began a successful counter-offensive, and the U.S. increased its support for Iraq to prevent Iran from forcing a surrender. In a U.S. bid to open full diplomatic relations with Iraq, the country was removed from the U.S. list of State Sponsors of Terrorism. Ostensibly this was because of improvement in the regime's record, although former U.S. Assistant Defense Secretary Noel Koch later stated, "No one had any doubts about [the Iraqis'] continued involvement in terrorism. ... The real reason was to help them succeed in the war against Iran." During the mid-to-late 1980s, international oil prices collapsed. The Organisation for Petroleum Exporting Countries (OPEC) established a quota system in which the international oil price (for its members) was set at US$18 per barrel. This system did not work, as Kuwait and the United Arab Emirate (UAE) did not follow OPEC policy and continued to flood the market with their oil. The result was that international oil prices were still at the 1970s level. In October 1988, because of Kuwait and the UAE, international oil prices had fallen to US$12 per barrel. The policy which the UAE (and especially Kuwait) followed hampered Iraq's economic growth. In the Iran–Iraq War's aftermath, Iraq had grown more dependent on oil prices. The result of Kuwait and the UAE's oil policies could be felt in 1990, when international oil prices decreased to US$13.67 per barrel. This time, the sudden fall in oil prices triggered reactions in Iraq; in Al-Thawra, the Ba'ath Party newspaper, Foreign Minister Aziz criticised Kuwait and the UAE's oil policies. Because of the sudden slump, Saddam claimed at an Arab League conference that international oil prices could increase to US$25 per barrel without hurting exports. Saddam also claimed that the abrupt fall in oil prices decreased Iraq's oil revenue by one billion dollars. Iraq was not the only member criticising Kuwait and the UAE; several other members also criticised their oil-production policy. Kuwait would not budge, continuing its oil-production strategy even when threatened by Iraq. This, coupled with foreign loans Iraq owned to Kuwait, was the main reason for the Iraqi invasion of Kuwait. 28 February 2003: Iraqi soldiers ride an MT-LB armored vehicle on an Iraqi highway, one month before the start of the Iraq War. Saddam Hussein and women students. Ba'athism promoted greater participation of women in Iraqi society. By the end of the 1970s women in Iraq formed 46 per cent of all teachers, 29 per cent of all doctors, 46 per cent of all dentists and 70 per cent of all pharmacists. The Ba'athist era was a period of secularisation in Iraq. The government included people from multiple religious affiliations (including Sunni Muslims, Shia Muslims and Christians). However, the period was marked (especially under Saddam Hussein) by sectarian, religious and political strife between the government and other groups: Shia Muslims (mainly drawn from Arabs, this religious group formed an absolute majority) who sought to create an Iraqi theocracy; ethnic Kurds, who sought independence for their region; Sunnis with an Islamist ideology, and non-Ba'athists (such as the Iraqi communists who were heavily suppressed in 1978). The Iraqi government promoted women's rights to a degree, allowing them education and service in the armed forces, but—despite the Ba'ath's avowed "radicalism"—its changes to family law were "considerably less radical than ... the Shah's family reforms, to say nothing of Ataturk's radical break with Islamic family law in 1926." The government sought restoration of Iraqi cultural heritage, such as rebuilding replicas of parts of the ancient city of Babylon. Under Saddam Hussein, the glorification of Saddam and the Ba'athist government was common in state-sponsored artwork. The Ba'ath Party dominated the political life of the country, although a National Progressive Front was proclaimed in 1974 to allow for the (mostly nominal) participation of non-Ba'athist figures and parties in Iraqi politics. ^ Coughlin 2005, p. 53. ^ Coughlin 2005, p. 54. ^ Coughlin 2005, p. 55. ^ Coughlin 2005, pp. 56–57. ^ Coughlin 2005, p. 57. ^ Coughlin 2005, p. 58. ^ Coughlin 2005, pp. 209, 218–219. ^ Coughlin 2005, p. 219. ^ Coughlin 2005, p. 220. ^ Roberts, Paul (2005). The End of Oil: On the Edge of a Perilous New World. Houghton Mifflin Harcourt. p. 105. ISBN 978-0-618-56211-4. ^ Arnold, James (2008). Saddam Hussein's Iraq. Twenty-First Century Books. p. 70. ISBN 978-0-8225-8665-4. ^ Finlan, Alastair (2008). The Gulf War of 1991. Rosen Publishing Group. pp. 12–13. ISBN 978-1-4358-7498-5. ^ Fisk, Robert (2005). The Great War for Civilisation: The Conquest of the Middle East. Fourth Estate. pp. 646–647. ISBN 978-0-00-720383-3. ^ Cohen, Warren (2005). America's Failing Empire: U.S. foreign relations since the Cold War. Wiley-Blackwell. p. 25. ISBN 978-1-4051-1427-1. ^ Fenton, Neil (2004). Understanding the UN Security Council: Coercion or Consent?. Ashgate Publishing, Ltd. p. 39. ISBN 978-0-7546-4092-9. ^ Fenton, Neil (2004). Understanding the UN Security Council: Coercion or Consent?. Ashgate Publishing, Ltd. p. 40. ISBN 978-0-7546-4092-9. ^ Dan Murphy (27 April 2004). "Sadr the agitator: like father, like son". The Christian Science Monitor. Retrieved 1 February 2013. ^ Tucker, Spencer (2010). The Encyclopedia of Middle East Wars: The United States in the Persian Gulf, Afghanistan, and Iraq Conflicts. 1. ABC-CLIO. pp. 1304–1305. ISBN 978-1-85109-947-4. ^ Schier, Steven (2009). Panorama of a Presidency: How George W. Bush Acquired and Spent his Political Capital. M.E. Sharpe. p. 143. ISBN 978-0-7656-1693-7. ^ Musallam, Musallam Ali (1996). The Iraqi Invasion of Kuwait: Saddam Hussein, His State and International Power Politics. British Academic Press. p. 62. ISBN 978-1-86064-020-9. ^ Ismael, Tareq (2008). The Rise and Fall of the Communist Party of Iraq. Cambridge University Press. pp. 172–173. ISBN 978-0-521-87394-9. ^ Eur (2002). The Middle East and North Africa. Routledge. p. 494. ISBN 978-1-85743-132-2. ^ Rabinovich, Itamar; Shaked, Haim (1987). Middle East Contemporary Survey: 1984–1985. Moshe Dayan Center for Middle Eastern and African Studies. pp. 467–468. ISBN 978-0-8133-7445-1. ^ Rabinovich, Itamar; Shaked, Haim (1987). Middle East Contemporary Survey: 1984–1985. Moshe Dayan Center for Middle Eastern and African Studies. p. 468. ISBN 978-0-8133-7445-1. ^ Rabinovich, Itamar; Shaked, Haim (1987). Middle East Contemporary Survey: 1984–1985. Moshe Dayan Center for Middle Eastern and African Studies. p. 469. ISBN 978-0-8133-7445-1. ^ al-Marashi, Ibrahim; Salama, Sammy (2008). Iraq's Armed Forces: an Analytical History (Paperback). Oxon, England, UK; New York, New York, USA: Routledge. p. 108. ISBN 978-0-415-40078-7. ^ Niblock 1982, p. 65. ^ Niblock 1982, pp. 70–71. ^ Niblock 1982, p. 71. ^ Niblock 1982, p. 70. ^ "Izzat Ibrahim Al-Douri / Izzat Ibrahim al-Duri". Global Security. Retrieved 7 April 2015. ^ "ON POINT II: Transition to the New Campaign". Global Security. Retrieved 7 April 2015. ^ Khalil F. Osman (2015). "Sectarianism in Iraq: The Making of State and Nation Since 1920". Routledge Studies in Middle Eastern Democratization and Government. Routledge. ISBN 978-1-138-77946-4. ^ "Most of Islamic State's leaders were officers in Saddam Hussein's Iraq". Washington Post. 4 April 2015. Retrieved 7 April 2015. ^ Nicolas Dessaux, Les femmes dans le marasme irakien, Bulletin de l'Action des chrétiens pour l'abolition de la torture n° 273, 2007. ^ Amatzia Baram (October 2011). "From Militant Secularism to Islamism: The Iraqi Ba'th Regime 1968-2003" (PDF). Woodrow Wilson International Center for Scholars: History & Public Policy Program: 21. Archived from the original (PDF) on 22 July 2015. Retrieved 7 April 2015. ^ Smolansky, Oleg; Smolansky, Bettie (1991). The USSR and Iraq: The Soviet Quest for Influence. Duke University Press. p. 16. ISBN 978-0-8223-1116-4. ^ Smolansky, Oleg; Smolansky, Bettie (1991). The USSR and Iraq: The Soviet Quest for Influence. Duke University Press. p. 234. ISBN 978-0-8223-1116-4. ^ Smolansky, Oleg; Smolansky, Bettie (1991). The USSR and Iraq: The Soviet Quest for Influence. Duke University Press. p. 235. ISBN 978-0-8223-1116-4. ^ Freedman, Robert (1991). Moscow and the Middle East: Soviet Policy since the Invasion of Afghanistan. Cambridge University Press Archive. p. 148. ISBN 978-0-521-35976-4. ^ Zemtsov, Ilya (1989). Chernenko: The Last Bolshevik: The Soviet Union on the Eve of Perestroika. Transaction Publishers. p. 246. ISBN 978-0-88738-260-4. ^ Farhang, Rajaee (1991). The Iran–Iraq War: The Politics of Aggression. University Press of Florida. p. 74. ISBN 978-0-8130-1176-9. ^ Donaldson, Gary (1996). America at War since 1945: Politics and Diplomacy in Korea, Vietnam, and the Gulf War. Greenwood Publishing Group. pp. 175–176. ISBN 978-0-275-95660-8. ^ Gupta, R.C. (1997). Collapse of the Soviet Union. Krishna Prakashan. p. 158. ISBN 978-81-8584281-3. ^ Douglas A. Borer (2003). "Inverse Engagement: Lessons from U.S.-Iraq Relations, 1982–1990". U.S. Army Professional Writing Collection. U.S. Army. Archived from the original on 11 October 2006. Retrieved 12 October 2006. ^ Alnasrawi 1994, p. 55. ^ Alnasrawi 1994, pp. 72–73. ^ Alnasrawi 1994, p. 73. ^ Alnasrawi 1994, p. 74. ^ Alnasrawi 1994, p. 79. ^ Rajaee, Farhang (1997). Iranian perspectives on the Iran–Iraq War. University Press of Florida. p. 156. ISBN 978-0-8130-1476-0. ^ Azhary, M.L. (1984). The Iran–Iraq War: an Historical, Economic, and Political Analysis. Routledge. pp. 54–55. ISBN 978-0-7099-0925-5. ^ Azhary, M.L. (1984). The Iran–Iraq War: an Historical, Economic, and Political Analysis. Routledge. p. 62. ISBN 978-0-7099-0925-5. ^ Levy, Barry; Sidel, Victor (2000). War and Public Health. American Public Health Association. p. 255. ISBN 978-0-87553-023-9. ^ Marshall Cavendish (2006). World and Its Peoples. Marshall Cavendish. pp. 231–232. ISBN 978-0-7614-7571-2. ^ Alnasrawi 1994, p. 115. ^ Alnasrawi 1994, pp. 115–116. ^ Alnasrawi 1994, p. 117. ^ Selden 1999, pp. 87–88. ^ Selden 1999, pp. 88–89. ^ Selden 1999, p. 89. ^ Selden 1999, p. 90. ^ Selden 1999, p. 91. ^ Selden 1999, pp. 93–94. ^ a b Litwak, Robert (2007). Regime Change: U.S. Strategy through the Prism of 9/11. Johns Hopkins University Press. p. 154. ISBN 978-0-8018-8642-3. ^ Litwak, Robert (2007). Regime Change: U.S. Strategy through the Prism of 9/11. Johns Hopkins University Press. pp. 154–155. ISBN 978-0-8018-8642-3. ^ Litwak, Robert (2007). Regime Change: U.S. Strategy through the Prism of 9/11. Johns Hopkins University Press. p. 155. ISBN 978-0-8018-8642-3. ^ Riad El Ghonemy, Mohamad (1998). Affluence and Poverty in the Middle East. Routledge. p. 106. ISBN 978-0-415-10033-5. ^ Riad El Ghonemy, Mohamad (1998). Affluence and Poverty in the Middle East. Routledge. pp. 106–107. ISBN 978-0-415-10033-5. ^ Riad El Ghonemy, Mohamad (1998). Affluence and Poverty in the Middle East. Routledge. p. 107. ISBN 978-0-415-10033-5. ^ a b Childs, John; Corvisier, André (1994). A Dictionary of Military History and the Art of War. Wiley-Blackwell. p. 403. ISBN 978-0-631-16848-5. ^ Knights, Michael (2005). Cradle of Conflict: Iraq and the Birth of Modern U.S. Military Power. United States Naval Institute. p. 20. ISBN 978-1-59114-444-1. ^ Shimko, Keith (2010). The Iraq Wars and America's Military Revolution. Cambridge University Press. p. 55. ISBN 978-0-521-12884-1. ^ Cordesman, Anthony (2002). Iraq's Military Capabilities in 2002: a Dynamic Net Assessment. Canadian Security Intelligence Service. p. 1. ISBN 978-0-89206-416-8. ^ Al-Khalil, Samir. Khalil, 11 April 1991. Iraq and Its Future. [url=https://www.nybooks.com/articles/1991/04/11/iraq-and-its-future New York Review of Books]. ^ Makiya, Kanan (1998). Republic of Fear: The Politics of Modern Iraq, Updated Edition. University of California Press. pp. 88–93. ISBN 9780520921245. The 1975 Algiers Agreement (commonly known as the Algiers Accord, sometimes as the Algiers Declaration) was an agreement between Iran and Iraq to settle their border disputes and conflicts (such as the Shatt al-Arab, known as Arvand Rud in Iran), and it served as basis for the bilateral treaties signed on 13 June and 26 December 1975. The agreement was meant to end the disputes between Iraq and Iran on their borders in Shatt al-Arab and Khuzestan, but the main reason for Iraq was to end the Kurdish rebellion. Less than six years after signing the treaty, on 17 September 1980, Iraq abolished the treaty but under international law, one nation cannot unilaterally reject a previously ratified treaty, and the treaty had no clause providing for abrogation by one nation only. Friction remains along the border despite the currently binding treaty and its detailed boundary delimitation remaining in force since it was signed in 1975 and ratified in 1976 by both nations. Benzene Convention, 1971 is an International Labour Organization Convention. Continuity of Employment (Seafarers) Convention, 1976 is an International Labour Organization Convention. Hours of Work and Rest Periods (Road Transport) Convention, 1979 is an International Labour Organization Convention. The Kuwaiti Government-in-exile (Arabic: الحكومة الكويتية في المنفى‎) was the government-in-exile of Kuwait following the Ba'athist Iraqi invasion and occupation of Kuwait, during the Gulf War. On 2 August 1990, Sheikh Jaber Al-Ahmad Al-Jaber Al-Sabah and senior members of his government fled to Saudi Arabia, where they set up a government-in-exile in Ta'if. The Kuwaiti government in exile was far more affluent than most other such governments, having full disposal of the very considerable Kuwaiti assets in western banks—of which it made use to conduct a massive propaganda campaign denouncing the Ba'athist Iraqi occupation and mobilizing public opinion in the western hemisphere in favor of war with Ba'athist Iraq. In March 1991, following the defeat of Ba'athist Iraq at the hands of coalition forces in the Persian Gulf War, the Sheikh and his government were able to return to Kuwait. 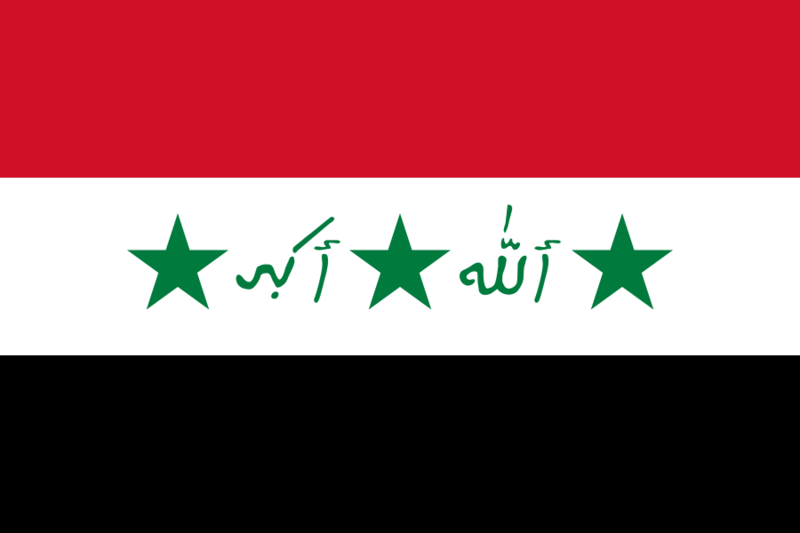 The Ministry of Defence (Arabic: وزارة الدفاع العراقية‎) is the Iraqi government agency responsible for defence of Iraq. It is also involved with internal security. Mohammed Younis al-Ahmed al-Muwali (Arabic: محمد يونس الأحمد‎) aka Khadr al-Sabahi is a former senior member of the Iraqi Ba'ath Party. Ahmed currently has a million dollar bounty placed on his head as one of Iraq's most wanted men accused of funding and leading resistance operations. He is the leader of al-Awda; an underground Ba'athist movement in Iraq. The Nationalist Democratic Assembly (Arabic: التجمع القومي الديمقراطي‎, Al-Tajamu'u Al-Qawmi Al-Dimuqratiyah) is a political party in Bahrain. It is the Bahraini regional branch of the Iraqi-led Ba'ath Party. The party is led by Secretary General Hassan Ali and Deputy Secretary General Mahmoud Kassab. It was established by Bahrainis who had studied in Ba'athist Iraq during the 1960s and 1970s. The party boycotted the 2002 parliamentary election but not the 2006 election. The 2011 parliamentary by-election was boycotted by the party in solidarity with the Bahraini uprising. It is headquartered in Zinj.The party opposes the government's naturalisation policies, and contends that it is unfair for ethnic Bahrainis to compete equally with foreign workers for jobs. It remains pro-Saddam Hussein and, according to its webpage, supports the Arab Spring. It opposed the 2003 invasion of Iraq, considering it an act of brutality against the Iraqi people. The party actively supports the overthrow of the existing monarchy, with a peaceful transition to democracy.It is part of a four-party opposition alliance opposing the government, which comprises two Shia Islamist parties (Al Wefaq and the Islamic Action Society) and the leftist National Democratic Action Society. Nursing Personnel Convention, 1977 is an International Labour Organization Convention. Occupational Safety and Health (Dock Work) Convention, 1979 is an International Labour Organization Convention. Having decided upon the adoption of certain proposals with regard to the revision of the Protection against Accidents (Dockers) Convention (Revised), 1932 (No. 32),.. The Convention on Damage Caused by Foreign Aircraft to Third Parties on the Surface, commonly called the Rome Convention, is an international treaty, concluded at Rome on October 7, 1952. It entered into force on February 4, 1958, and as of 2018 has been ratified by 51 states. Canada, Australia, and Nigeria were previous state parties but have denounced the treaty. Safety and Health in Construction Convention, 1988 is an International Labour Organization Convention. Seafarers' Annual Leave with Pay Convention, 1976 is an International Labour Organization Convention. The Iraqi Special Republican Guard (SRG) (Arabic: الحرس الجمهوري الخاص‎ ""Ḥaris al-‘Irāq al-Jamhūriyy al-Khas"), also known as the Special Forces Brigade of the Presidential Palace, Republican Guard Special Protection Forces, or the Golden Division, was an Iraqi personal security force founded in either early 1992 or March 1995 in Ba'athist Iraq. The Special Republican Guard was controlled by the Special Security Organization and charged with protecting President Saddam Hussein, presidential sites, Baghdad, and responding to any rebellion, coup, or other threat to his power. In March 1972 Ba'athist Iraq proposed Egypt and Syria to re-establish the United Arab Republic which dissolved in 1963. The Iraqi proposal was an immediate reaction to Jordan's proposal for a United Arab Kingdom but collided with the already established Federation of Arab Republics and failed because of Iraqi–Syrian differences. Iraq has three vice presidents or deputy presidents, although a debate is ongoing about whether the position should be abolished. The office of Vice-President was historically largely ceremonial but prestigious. In post-war Iraq, the Constitution of Iraq, in its "Transitional Guidelines," creates a three-member Presidency (or Presidential) Council, consisting of the President of the Republic and two deputy presidents, who must act in unison. The Presidency Council had three members to accommodate Iraq's three largest groups: Sunni Muslim Arabs, Shiite Muslim Arabs, and the mostly Sunni Kurds. As a unit, the Presidency Council was meant to symbolize the unity of the nation. This arrangement is required by the constitution to continue until the Council of Representatives, enters its second set of sessions. At this point, the Presidency Council would be replaced by a solitary President of the Republic, who would have only one deputy, the Vice-President. In any case, the Presidency is appointed by the Council of Representatives. The three-member arrangement was a hold-over from the Iraqi interim government and the Iraqi Transitional Government. On September 2014, three new Vice Presidents were elected: former Prime Ministers Nouri al-Maliki and Ayad Allawi and former Speaker of Parliament Osama al-Nujaifi.On August 11, 2015 the Council of Representatives approved the al Abadi government plan to abolish the posts of both Vice President and Deputy Prime Minister. Later, Osama al-Nujaifi filed a complaint against the decision, considering it to be against the Constitution. Also Nuri al-Maliki promised to cling to his post. On 10 October 2016, the three posts of Vice President were restored by the Supreme Court of Iraq which deemed their abolition unconstitutional. The Working Conditions (Hotels and Restaurants) Convention, 1991, officially the Convention concerning Working Conditions in Hotels, Restaurants and similar Establishments is an International Labour Organization Convention adopted in 1991 during the 78 International Labour Conference. It sets standards for work in hotels and restaurants. According to the convention, workers have a right to "reasonable normal hours of work" and "minimum daily and weekly rest periods", compensation (in time or remuneration) of work on holidays. Furthermore a basic remuneration should be paid in regular intervals, regardless of tips. Working Environment (Air Pollution, Noise and Vibration) Convention, 1977 is an International Labour Organization Convention.